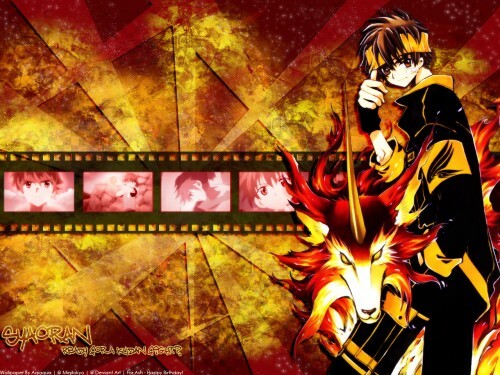 Tsubasa Reservoir Chronicle Wallpaper: Ready for a Kudan Fight? Minitokyo »	Tsubasa Reservoir Chronicle Wallpapers » Tsubasa Reservoir Chronicle Wallpaper: Ready for a Kudan Fight? Weeeheee~~ It ish done! And back to my love of random abstractness! I made it for my friend Ash's birthday! (which is today, 5th October) She's fully obsessed with Syaoran now O_O (I've lent her my Tsubasa Volumes). She loves the Hanshin Republic, and the kudans, particularly Rayearth! (So do I, but Windam pwns :D I like birds :D). For the actual wallie, umm, I used lots of Grungey brushes, and added a filmstrip in the middle with a few shots of Syaoran from episode 6 I think. And I didn't forget the sparkles, although they're somewhat different from what I'd usually use, they look more like dust. Although she hasn't registered at minitokyo, HAPPY BIRTHDAY ASHIE! Faves and comments are appreciated :D.
wow, very cool background. burning red. It's a very lovely Syao wall! I think the whole wall fits very well, the Syao on the right, the background and the film strip. Nice job :) I'm going to rec to my friend, who's also obsessed with Syaoran, hehe. And it's an awesome one too! I LOVE the background! It totally matches with the scan! And the film stripes were a nice touch! You must have worked hard on the background, but you can be proud of the final result! The bg is wonderfull, nice art! AaaaAAAhhhhhHHHHHHHHH~ ~ Syaoran is soo cute in this one! I think I'm retardedly retarded for missing out this wall as well ^_^' Too many notifs >.< I really love this wall~! Burn baby, burn! XD The abstract and the colours look really wonderful ! Syaoran's ready to kick some a**~! A wall bursting with energy XD Keep it up! Thanks for this great scan! beautiful wallpaper really very good!